In a Small Business Saturday competition we reported on here last year, American Express OPEN and Etsy asked retail shops to host in-store trunk shows featuring local Etsy sellers and promised a prize to one winner. In December, Etsy announced that the four-year-old San Diego store Make Good had been randomly selected from among 200 participants. 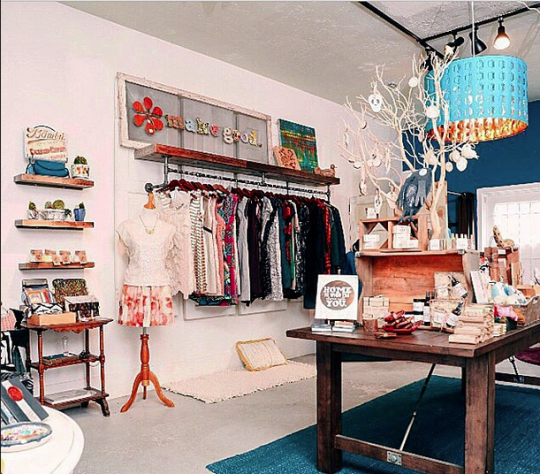 The neighborhood store, owned by Sophia Hall, a maker, and John Hall, an artist, sells hand-crafted products made by more than 100 artisans in San Diego and Tijuana. We spoke with the Halls about their business, what they learned from the makeover, and how it has affected sales. YSB: How did your store get its start? 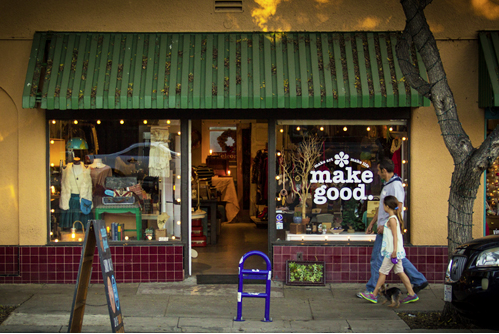 Make Good: We’ve lived in San Diego’s Greater Golden Hill neighborhood since 2008. We got involved in the local artist-maker-handcrafter movement that was happening here and around the world. We transformed the downstairs of our house into an art show/trunk show/craft show and had four living room shows a year. We knew we were on to something a year into it. From there, the idea grew organically. A friend who had owned a video rental store in South Park encouraged Sophia to take over the small retail space and open her own store. We rallied friends to go in and paint and fix it up and we opened the store with goods from eight local artisans. Now we have 137 artists represented in the shop, as young as 10 all the way up to age 70. YSB: What sorts of goods do you sell? Make Good: Every genre of art: Homegoods, paintings, jewelry, stuff for kids, clothing, soaps, and candles. It’s representative of what’s happening in the handmade maker movement in San Diego and Tijuana. We’re like a brick and mortar Etsy shop. YSB: Can you tell us more about the Tijuana artisans? Make Good: The artisan movement is happening also in Tijuana. Immigration issues are so politicized that the border between the cities feels impermeable—the vast majority of San Diegans never cross it—but our border is the most crossed international border in the world, with people living on one side and working on the other. YSB: Why did you enter the American Express OPEN-Etsy makeover contest? 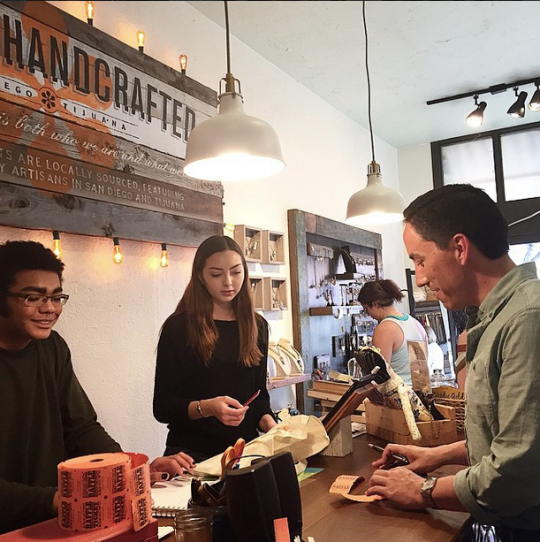 Make Good: The concept behind Small Business Saturday aligns with who we are. Here in San Diego, people flock to malls for Black Friday. Small Business Saturday calls attention to the public: “don’t forget to support small business!” Over the last few years we’ve seen more and more customers have a growing awareness of that. Small Business Saturday this year was the biggest single sales day we’ve ever had. We took advantage of all the things Amex had to offer. And the partnership with Etsy aligned with us because we’re connected already with Etsy sellers. One requirement of the sweepstakes was to host an Etsy seller trunk show during Small Business Saturday in our store, which was kind of thing we would do anyway. We hosted Urban Industrial Craft, a guy who started experimenting making lamps out of pipes and Edison bulbs. YSB: What about your store did you want help making over? Make Good: It didn’t occur to me that I might actually win. But we have eclectic stuff and are a place of discovery. We have a fairly small footprint in the store, and we needed to maximize our floor space. We also needed to improve how we displayed and merchandised jewelry. We had jewelry spread out on tables. The Rue Magazine designers’ questions helped us determine what’s important and not important–things we never had time to sit down and consider. Their contribution was more from the aesthetic side. The $5,000 from American Express let us reinvest in some local artisans. We asked the artists at Chesire Salvage, whose goods we had just started selling in our store, “Are you up for a challenge?” We asked them to find reclaimed materials and they built all of our clothing displays and jewelry display from wood salvaged from an old barge in the San Diego Bay. And we spent some of the money on a chair from Folk Project, which finds and recovers chairs. YSB: Has the redesign impacted sales? More people are discovering our retail section. And we’ve seen that men like buying jewelry, but they used to be overwhelmed by our selection. Now anyone can come in and walk up to a wall with a beautiful display. It’s really nice to see a person not be puzzled, and they choose really quickly: “That’s it! Pack it up! Let’s go!” They came in with something on their mind, they found it, they love it. Sales have increased in those two sections. Doing a redesign is great and it’s also extremely challenging. We’re so grateful for the whole experience. It was a lot more work and effort than we expected. You have to be prepared for that. Considering making over your own retail space? Here are Rue Magazine’s tips for in-store redesigns. Start from the ground up. Use rugs to “anchor” various sections of the space. It brings color, comfort, and is more cost effective than refinishing the floors. Stick to one accent wall. Too many paint colors will distract shoppers from the products themselves. Also choose simple shelving if the room is already full with color from objects and painted walls. Be mindful of lighting. Lamps, pretty pendants, and task lighting make for a cozier experience than fluorescent lighting. Don’t be afraid of DIYs. Instead of investing in a brand new cash-wrap, the team at Make Good refinished a table they owned. It was a perfect size, and the addition of ceiling tiles to the front made the piece look unique and stylish. Pare down and work up. Sometimes it’s not about what you add, but what you take away. Removing unnecessary objects is key for bringing a sense of calm to a home or retail space. Another easy way to de-clutter is to maximize vertical space by hanging artwork and larger shelves higher on the walls. For John and Sophia, this was a great way to spotlight products.